This amendment consolidates the existing South Atlantic and Gulf of Mexico federal dealer permits and requires permits for dealers who currently are not required to have one. The amendment additionally increases the frequency of federal dealer reporting from monthly to weekly and establishes requirements to maintain a federal dealer permit. The amendment went into effect on August 7, 2014. This amendment addresses a requirement in the Reauthorized Magnuson-Stevens Act of 2006 to establish Annual Catch Limits and Accountability Measures for federally managed species. The amendment has been approved by the Secretary of Commerce. This rule is effective January 30, 2012 except for the amendments to § 622.32(b)(2)(iii) and § 622.39(b)(1)(ii). NOAA will publish a document announcing the effective date of the amendments to § 622.32(b)(2)(iii) and § 622.39(b)(1)(ii) in the Federal Register. This amendment addressed EFH requirements, Habitat Areas of Particular Concern (HAPCs), and adverse effects of fishing in the fisheries for shrimp, red drum, reef fish, stone crab, coral, and coral reefs in the Gulf of Mexico, as well as spiny lobster and the CMP resources of the Gulf of Mexico and Atlantic Ocean. Management measures include; prohibiting bottom anchoring to protect coral reefs in the East and West Flower Garden Banks, McGrail Bank, Pulley Ridge, and the North and South Tortugas Ecological Reserves, as well as Stetson Bank HAPCs prohibiting longlines, buoy gear, and all traps/pots to protect coral reefs in those same HAPCs; and requiring a weak link in the tickler chain of bottom trawls on all habitats throughout the Gulf EEZ. This final rule is effective January 23, 2006, except for § 622.34(q), which is effective January 24, 2006. This amendment was to all 7 fishery managment plans (FMP) and created two marine reserves where all fishing is prohibited. One 60 sq. mile reserve was created on a spawning aggregation site for mutton snapper in the GUlf of Mexico Fishery Mangement Council’s (GMFMC) jurisdiction. The other (125 sq. miles) was created in the jurisdictions of the National Park Service (NPS), Florida Keys National Marine Sanctuary (FKNMS), GMFMC, and State of Florida. These reserves will provide for research to assess the value of no-use reserves. The amendment number for each FMP is as follows: Mackerel (13), Coral (4), Red Drum (4), Reef Fish (19), Shrimp (12), Spiny Lobster (7), and Stone Crab (8). This final rule is effective August 19, 2002. This amendment was to all 7 fishery management plans (FMP) and addresses the new provisions implemented by the SFA that pertain to preventing overfishing and rebuilding of overfished stocks. 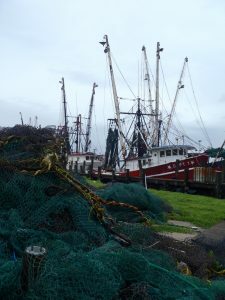 It also provides demographic and economic information on fishing communities. It proposed scientific definitions for each stock managed by the Council for: maximum sustainable yield (MSY), optimum yield (OY), Maximum Fishing Mortality Thresholds (MFMT), and for Minimum Stock Size Thresholds (MSST). It proposed rebuilding plans for overfished stocks for which such data were available. It assessed bycatch and proposed reporting requirements for bycatch. This final rule is effective June 19, 2000.